The House of Representatives will reconvene on Sunday evening, just less than 30 hours before the United States reaches the fiscal cliff. House Speaker John Boehner, R-Ohio, notified lawmakers that the House would come to order at 6:30 p.m. ET on Sunday in hopes of averting the end-of-year combination of tax hikes and spending cuts that constitute the fiscal cliff. With five days until the Bush-era tax cuts expire, House Speaker John Boehner has essentially removed the House from final negotiations, telling the Senate it's up to them to come up with a deal that his chamber will pass. "We've done our job, it's up to the Senate to act," Boehner told members, according to a lawmaker on the call. "We'll see if they do anything." Related: What happens if we go over the cliff? Whether any final deal could emerge in the waning hours before the Dec. 31 deadline was less clear. There were rumblings of a meeting on Friday between President Barack Obama and leaders in Congress. (A senior administration official told NBC's Kristen Welker that no such meeting had been set up.) And the White House shot down Republican-fueled indications that the Obama administration had made a new entreaty to the GOP in hopes of averting the fiscal cliff. Obama called congressional leaders on Wednesday evening before departing Hawaii to return to Washington, initiating conversations that fell largely dormant during the Christmas holiday this past weekend. Among the complicating details include the ideological split in both parties that might force relative moderates from both parties to join forces to advance any final deal. The Senate and President Obama return to Washington on Thursday to again work on the fiscal cliff. What can we expect? NBC News' Mike Viqueira and Peter Alexander discuss. Mark Murray also joins the discussion. The lawmaker on Thursday's call told NBC News that any Senate plan Boehner puts on the House floor (of which there is no guarantee) would only receive as few as 40 Republican votes, making Democratic help necessary. "If the Senate will not approve these bills and send them to the president to be signed into law in their current form, they must be amended and returned to the House," Boehner told Republicans Thursday, according to a source on the call. "Once this has occurred, the House will then consider whether to accept the bills as amended, or to send them back to the Senate with additional amendments. The House will take this action on whatever the Senate can pass -- but the Senate must act." 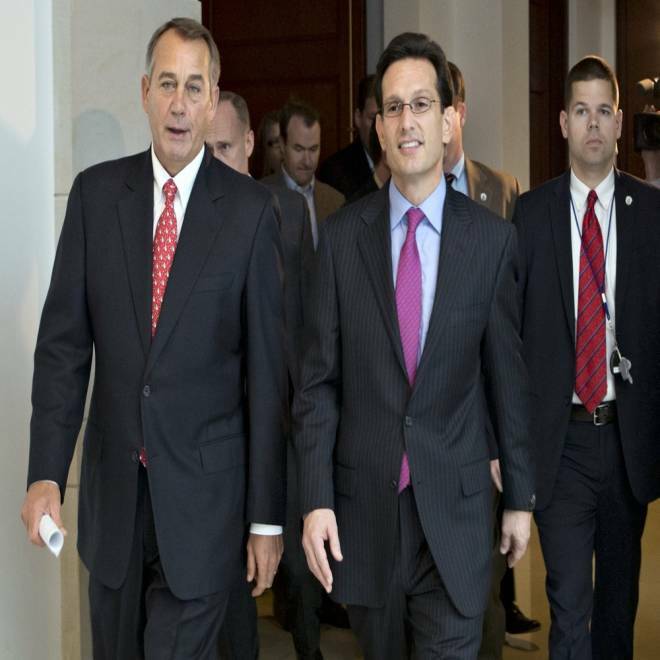 Speaker of the House John Boehner, R-Ohio, left, joined by House Majority Leader Eric Cantor, R-Va., returns to his office after speaking to reporters on the fiscal cliff negotiations, at the Capitol in Washington, Friday, Dec. 21, 2012.